Who are LifeNets Volunteers? See the list! What is still needed for LifeNets projects?? This is where you can help! On January 24th the Columbus, Ohio congregation held a Caribbean Island Social which held included a silent auction. More than $800 was raised. Pastor Randy Stiver commented, "We have been raising money for LifeNets while having a lot of fun with our annual fun show and silent auction." The church made an afghan and Connie Seiffert donated paintings to sell. 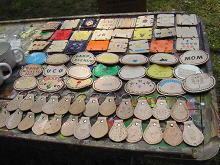 High quality birdhouses were also a popular item. Dr. Barbara Walls in Piscataway, New Jersey organizes a most wonderful LifeNets Ladies Charity Tea on June 22, 2008. It was well-attended and provided funding for almost an entire year for the LifeNets Orphan Care Centre in Balaka, Malawi. Take a look at a few more photos and the story about the event. September 2007 Walk for Hope in Long Beach, CA. September 8, 2007 Boot Scoot and Barbecue benefit in Ft. Worth, Texas raises $3500 for LifeNets Developing Nations Scholarship Fund. Leather goods made by campers at Buckeye Camp in Ohio during July. Proceeds from the sale went to LifeNets for our ongoing projects around the world. September 2006 Walk for Hope in Long Beach, CA. LifeNets receives more than $400. Ambassador Bible Center (ABC) in Cincinnati, Ohio puts on its 5th Annual Charity Evening Sunday, July 30 raising whopping record-breaking $5325 for the LifeNets Developing Nations Scholarship Program that helps send more than 60 young people to universities in their own countries. November 9, 2005 LifeNets Australia for Zambia -- What a wonderful gift!! $4,419.22 for wells, buildings and other urgent needs. 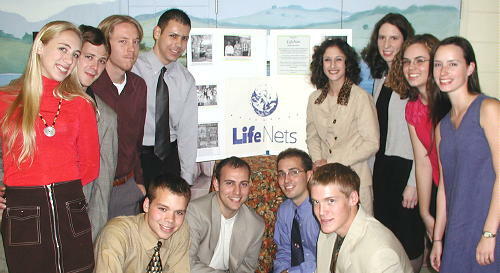 July 10, 2005 ABC Variety Show raises a record $3833.02 for the LifeNets Developing Nations Scholarship Fund! MORE!! July 13, 2003 LifeNets Charity Evening sponsored by ABC raises more than $2100 for the Developing Nations Scholarship Fund. Atlanta Young Adults Car Wash on August 4. 2002 sends El Salvadoran student to University for one year!